Fascinating art installation in which users post how they’re feeling (often in poetic style) and you randomly get to read them. You can narrow it down by geographic location, gender, weather, etc. There’s a very cool interview with the creators of this site. A bit complex. This is for you NASA types. And needless to say: it’s addictive. Don’t know what a “tifo” is? Maybe go here. Posted on August 31, 2007 January 15, 2016 Author Adam D.
Uhhh… self explanatory? 🙂 It’s weird that’s for sure. Quite funny. A little cruel perhaps. But still funny. It even has a discussion board. You are the shark. Move your mouse to move the shark, and hit your spacebar to bite. Addictive and fun. Posted on August 24, 2007 January 15, 2016 Author Adam D.
Sorry: No Friday links for this week as I am on vacation. Happy Friday! Format AsidePosted on August 17, 2007 April 21, 2015 Author Adam D.
A note that next week will sadly have no Friday links, as I will be on vacation in fabulous Quebec. An odd and fascinating piece of artwork by Howard Hallis. It’s still in progress. Inside: And I don’t mean that in the overly used Jerry Maguire kind of way. I mean it from the bottom of my heart. My life truly would not be the same without you. But I do wish you were less controlling. Originally sent to me wayyy back in 1999 by Eric B.. It’s still up, and still funny / sad enough that I thought it was worth sharing. It’s quite long but definitely entertaining. 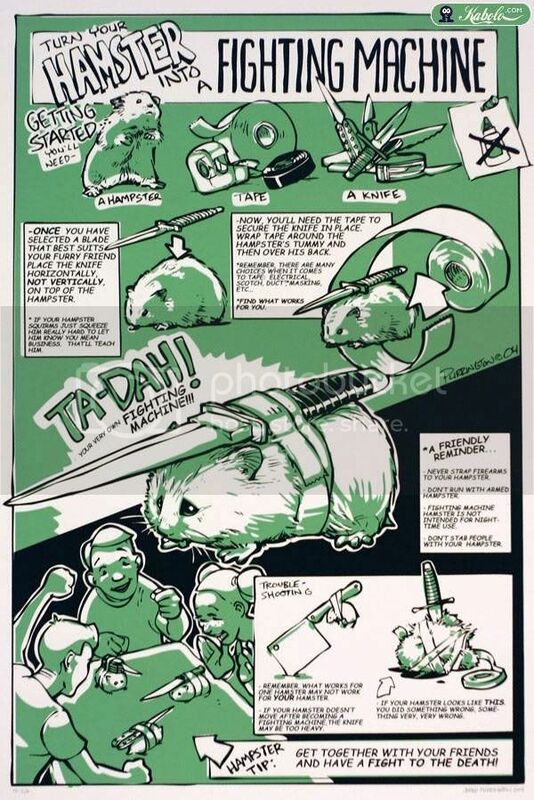 » Turn your hamster into a fighting machine! Posted on August 10, 2007 April 21, 2015 Author Adam D.
Today’s link-fest is largely photographic because that’s what seemed to be cropping up the most lately. Really beautifully executed. Must have taken a bit of time to set up. One of several very stylized photography galleries by Irene Müller. Several others worth looking at there as well. You can buy prints of these and other works by this photographer. From the makers of the Dyson vacuum cleaner. Posted on August 3, 2007 April 21, 2015 Author Adam D.